Hello PISO FARE friends! Here are Cebu Pacific seat sale 2017 as low as P599 to select destinations! Many promo tickets are now available for booking via this promo. Sale tickets are good for travel for September, October, November until December 15, 2017. See? You can use these cheap flights for your pre-Christmas vacation or when you go home to the provinces to celebrate All Saints’ Day/ All Souls’ Day or during the school semester break. For domestic routes, aside from the P599 sale tickets, up for grabs are the P799, P899 and other cheap fares. 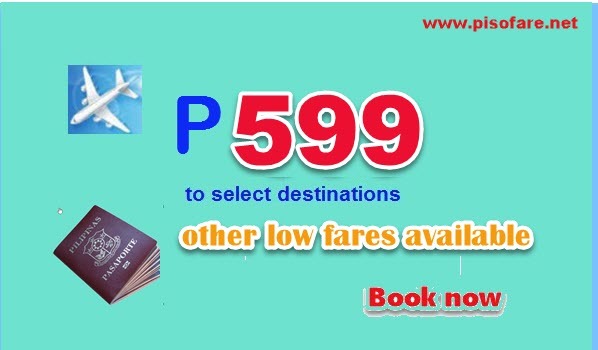 Fly to Bacolod or Tagbilaran from Cagayan De Oro for only P599 ALL IN Fare. Trips to Calbayog, Roxas or Ormoc from Cebu is still at P799. Check the sale tickets for other routes. 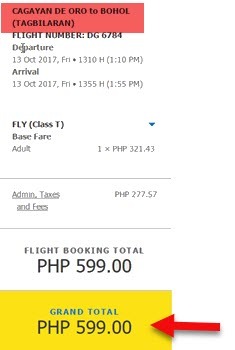 As for Cebu Pacific international promo fare, Singapore journey cost only P1,599 from Cebu, Clark, Davao or Iloilo and P2,099 from Manila. Hongkong, Seoul, Bali, Siem Reap and several other foreign destinations are included in the seat sale. Booking is ongoing until March 31. However, it is best if you book fast as the Cebu Pacific sale tickets are limited and subject to availability! We went online and check for Cebu Pacific promo tickets. Shared below is sample booking Sale Ticket Cagayan De Oro to Tagbilaran, Bohol. Cebu Pacific promo fares are inclusive of 7 kilos hand carry baggage, base fare, Web Admin Fee and taxes and fees. Checked baggage is not included, so, it is recommended to buy a Prepaid Baggage Allowance during booking to save on checked baggage fees. Tickets are valid for one-way journey. For your utmost comfort during your flight, you may purchase Add-Ons during booking or up to 4 hours before your flight departure. Besides the prepaid baggage, you can get your preferred seat, pre-book your meals or get travel insurance. The Cebu Pacific sale tickets can be avail by: a) booking online at www.cebupacificair.com, b) purchasing the cheap tickets at Cebu Pacific ticket offices, booking outlets and travel agencies accredited by the airline, c) calling Cebu Pacific hotline at these numbers: (02) 702 0888 (Manila) or (032) 230 8888 (Cebu). Where can you buy the sale tickets? Check these List of Ticketing Offices in Metro Manila, Luzon, Visayas and Mindanao. What are you waiting for? Book or buy the low fares now and travel to your desired destination with less expenses! For more Cebu Pacific promo fares 2017- 2018, other airlines seat sale, PISO FARES, Cabin Crew Hiring and travel updates 2017-2018, LIKE and FOLLOW our Facebook: PISO FARE TICKET!!! Please notify me if there will be promo sale of ticket for hongkong any month of this year 2017? please inform me if their was promo flight that been cancel on june 3, 2017. 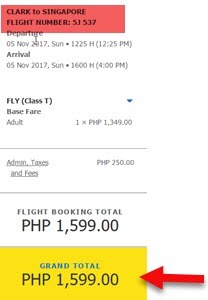 Pumunta ako sa site ng cebu pacific. Mahal ng ticket. Bakit ganun? is this only one way? or roundtrip? how do i book for tickets? Pls call us.09097625604we need it for reservation. Please read the post on how to avail the promo fare.